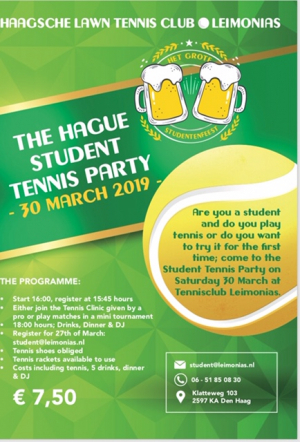 All students are welcome to join the The Hague Student Tennis Party on Saturday 30th of March at 16:00 hours. Please register by sending an email with your name to student@leimonias.nl. Everybody with a Student Pass, being a member or not, is welcome: whether you are a well-advanced player or whether you have never played before ! You can either go for a tennis clinic for beginners or join a mini tournament from 16:00 till 17:30. Costs EUR 7,50 for an afternoon tennis, dinner, 5 drinks and DJ !